The carnation pattern has now been discontinued but i have a significant quantity ofthis design in perfect new first quality condition. All are first quality and made in England. Royal Doulton — Carnation — Cake Plate. An earred Royal Doulton Carnation cake plate. This may be due to a marginal fault to the shape of the item (e.g. might be slightly lob-sided), the size or weight (e.g. the item might be slightly under or over the specified accepted size/weight), the finish (e.g. any print or decoration might be offset or slightly lighter/darker than the manufacturer's standard), or a number of other aspects that the manufacturer doesn't think is perfect enough. ROYAL DOULTON CARNATION TEA SET - 16 PIECE Great condition Well looked after Includes: 8 Cups 8 Saucers Free UK Delivery. 21 PIECE TEASET. 'CARNATION' H.5084. ROYAL DOULTON. 1ST QUALITY. BACKSTAMP: PER PHOTO. Royal Doulton CARNATION. Covered Sugar Box. Royal Doulton CARNATION. A Covered sugar box. Royal Doulton Carnation 5084 ( 1 Salt & 1 Pepper Pot ) 1st Quality. Royal Doulton Carnation Pattern H5084, this pattern was produced between 1983 until 1998 and is now discontinued. 1st Quality. 1 Pepper Pot. 1 Salt Pot. 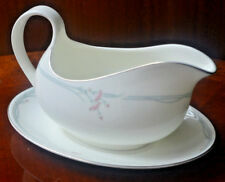 As stated,this Royal Doulton Carnation gravy / sauce boat is in excellent used order. All silver trim fine,no signs of any wear / cracks or hairlines ~ Factory first quality. I've taken several photo's which hopefully cover most angles. ROYAL DOULTON Carnation Salad Dessert Plate 8 inches In Good Condition In excellent condition with no chips, cracks, repairs or crazing. Minimal wear to Silver gilt. 6 available P&P in the UK £3.50 (postage discount for multiple items) Europe £7.50 Rest of the World £12 via airmail I am a trusted ebayer with 100% positive feedback so please bid with confidence. Please note postage and packing costs when bidding, UK items are sent via Hermes Courier. A beautiful fine quality now discontinued Royal Doulton "Carnation H5084" patterned Coffee Pot. White ground with pale grey and pink carnation design Height tp top of finial approx 23 cm. handle to spout 22 cm. 'CARNATION' H.5084. ROYAL DOULTON. SET OF 6 X DESSERT PLATES. 1ST QUALITY. BACKSTAMP: PER PHOTO. As stated,this Royal Doulton Carnation cereal bowl is in very good used order. Royal Doulton CARNATION. Dinner Plate. Diameter 10 5/8 inches. Royal Doulton CARNATION. A Dinner Plate. Complete silver trim. Six first class quality side plates as shown. £18.00. Collection only. Royal Doulton Carnation Oval Platter - H5084. 1st Quality. Otherwise In Excellent Condition. Quality China At The Right Price! Royal Doulton teacup and saucer in the popular Carnation pattern. H5084 Decorated with carnations and foliage on a white background with platinum edging. Measuring approx. 3'' tall 4 1/4'' across. Saucer 6'' across Fully backstamped with the Doulton logo. In excellent condition . No chips cracks or utensil scratches. Several available plus other items in this pattern. Thank for taking time out to look at my items. The Carnation pattern is rich and vibrant with excellent platinum gilding. Royal Doulton Bread and Butter Plate. Royal Doulton coffee can and saucer in the popular Carnation pattern. H5084 Decorated with carnations and foliage on a white background with platinum edging. Measuring approx. 2 1/2'' tall 3 1/4'' across. Saucer 5 1/2'' across Fully backstamped with the Doulton logo. In excellent condition . No chips cracks or utensil scratches. Several available plus other items in this pattern. Thank for taking time out to look at my items. Royal Doulton Carnation 6 x replacement saucers only for the normal tea cups.1st quality and never actually been used. Stored in a cupboard for years so mint condition. Measure approx 13.20cm wide. 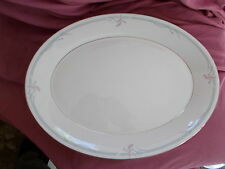 Royal Doulton salad plate in the popular Carnation pattern. H5084 Decorated with carnations and foliage on a white background with platinum edging. Measuring approx. 8'' across. Fully backstamped with the Doulton logo. In excellent condition . No chips cracks or utensil scratches. Several available plus other items in this pattern. Thank for taking time out to look at my items. ROYAL DOULTON CARNATION 2 1/2 PINT COFFEE POT. ROYAL DOULTON "CARNATION" LARGE COFFEE POT, H 5084. ITEM SHOWS ROYAL DOULTON BACKSTAMP. THE COFFEE POT STANDS 7 1/8" HIGH TO THE TIP OF THE SPOUT AND IS 8 1/2" TO THE TOP OF THE LID. Pp - uk - FREE. Royal Doulton Carnation Tea Plates - H5084. 1st Quality. Otherwise In Excellent Condition. Quality China At The Right Price! Price Is Per Plate. With the 'Royal Doulton H5084 English Fine Bone China 1982' mark on the base, produced from 1983 until discontinued in 1998. 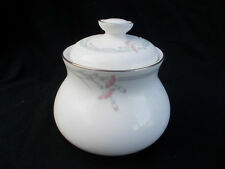 ROYAL DOULTON Carnation Open Sugar Bowl In excellent condition with no chips, cracks, repairs or crazing. Silver gilt intact Weighs 300gms P&P in the UK £3.50 Europe £7.50 Rest of the World £12 via airmail I am a trusted ebayer with 100% positive feedback so please bid with confidence. Please note postage and packing costs when bidding, UK items are sent via Hermes Courier. Royal Doulton CARNATION. Milk Jug. Capacity 1/2 pint. Royal Doulton CARNATION. A Milk Jug. Capacity 1/2 pint. As used with the tea service. Made in England. ROYAL DOULTON TABLEWARE LTD 1982. ROYAL DOULTON. Royal Doulton Milk Jug & Sugar Bowl. Royal Doulton CARNATION. Dessert Plate. Diameter 8 inches. Royal Doulton CARNATION. A Dessert Plate. Complete silver trim. Set of 6 Royal Doulton Carnation. Tea Plates design of Pink flowers with No silver Trim. Little sign of use odd pottery blemish. Royal Doulton Carnation. A Milk Jug in theDoulton Carnation design. with any aspect of the sale and I will reply with in 24 hours. This is not done intentionally to deceive anybody. I try to describe the item to the best of my ability but none of of us are perfect. 1st Quality. Otherwise In Excellent Condition. Quality China At The Right Price! ROYAL DOULTON. DINNER PLATE 25 CMS. LOOKS UNUSED. ROYAL DOULTON CARNATION CUP AND SAUCER. ROYAL DOULTON "CARNATION" CUP AND SAUCER, H 5084. THE CUP STANDS 3 1/8" HIGH AND IS 3 1/2" WIDE, THE SAUCER IS 6 1/8" WIDE. BRIGHT GILDING, CLEAN INSIDE AND OUT. MORE TABLEWARE AND COLLECTABLES AVAILABLE @ CHINAFIND UK. Royal Doulton CARNATION. Side Plate. Diameter 6 1/2 inches. Royal Doulton CARNATION. A Side Plate. Complete silver trim. Royal doulton tea cup and saucer . Carnation. Vintage fine bone china 1982. Royal Doulton Tableware Ltd 1982. Tea cup and saucer. English fine bone china. ROYAL DOULTON. TEA CUP SAUCER PLATE. Collection available from Billericay, Essex or Sittingbourne, Kent. Condition: Excellent. Royal Doulton side plate in the popular Carnation pattern. H5084 Decorated with carnations and foliage on a white background with platinum edging. Measuring approx. 6 1/2'' across. Fully backstamped with the Doulton logo. In excellent condition . No chips cracks or utensil scratches. Several available plus other items in this pattern. Thank for taking time out to look at my items. Royal Doulton CARNATION. A Teacup and Saucer.